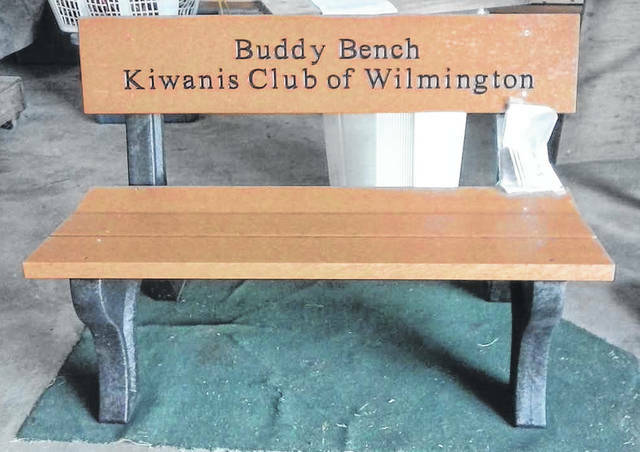 An up-close look at a Kiwanis Buddy Bench. Students and Kiwanians at Denver Elementary. Students and Kiwanians at Sabina Elementary. Holmes Elementary students at the dedication there joined by Kiwanians as well as Chad Weaver with R&L Carriers. 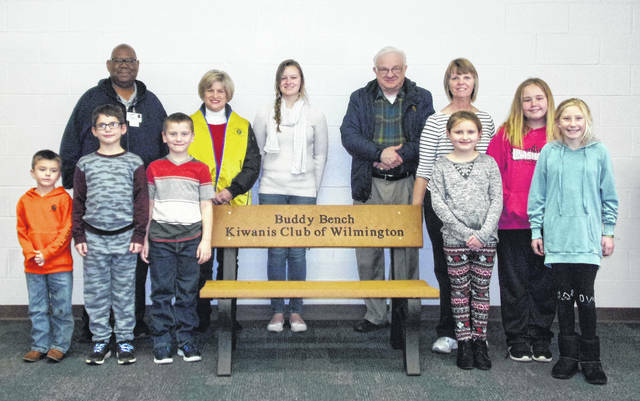 The Kiwanis Club of Wilmington received a grant from the Ohio Kiwanis Foundation in September to fund a Buddy Bench project. 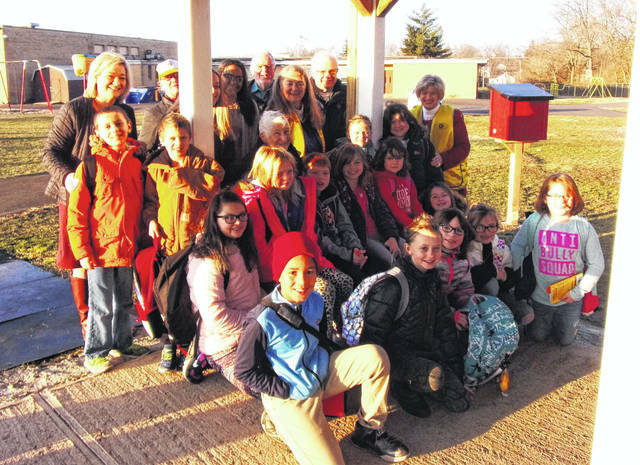 Schools selected to receive a bench were Sabina and New Vienna Elementary in the East Clinton School District and Holmes and Denver in the Wilmington City Schools District. R&L Carriers provided shipment of the benches from Michigan to the home office in Wilmington. The Kiwanis Club is very appreciative of their generosity and commitment to the children of Clinton County. Buddy Benches are a wonderful addition to any playground. Each is considered a “Friendship Bench” that helps children socialize and provides an area that children can go to if they are feeling lonely or left out on the playground. When a child sits on the Buddy Bench, this signals other children that they would like to be included. Teachers, administrators and parents appreciate having the bench to help those children having a bad day. Teaching children about kindness and helping others can combat loneliness on the playground and benefit the entire school atmosphere: Need a Buddy? Be a Buddy! Kiwanis is an international service organization that has been serving the needs of children for over 100 years. Locally, the Kiwanis Club of Wilmington serves children through a Literacy Program at a local food pantry, supports 4-H, Boy Scouts and Girl Scouts, a scholarship for a Clinton County graduate, sponsors Key Clubs at East Clinton, Clinton Massie and Wilmington High School, an Akiton Club at PCS Orion, plus many more. For more information contact Treasurer Ron Johnson at 937-289-7226.